24 last year, no season nine? 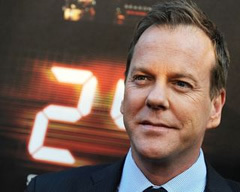 Is the clock finally running out for Jack Bauer? According to Kevin Reilly, Fox Entertainment President, this season may be the last for Kiefer Sutherland’s oft-tortured hero. At the recent TV Critic’s summer press tour, Reilly told iFmagazine that the upcoming season is the last one under the show’s current contract. And while Sutherland remains committed to the show, Reilly is unsure of its future. Is it time for 24 to end as a weekly show? Admittedly the show’s numbers have slipped a bit in the last couple seasons — from a high of 13.78 million in season five to 12.62 million in season seven — but did place 20th in overall viewers this year. In the end, it may be just too expensive for the network, especially considering that the contracts are up for renewal. Though the commercials for 24 are, next to American Idol, the most expensive in primetime, the network’s ad sales are also down about 16% from last year. What do you think? Is it time for Jack to say goodbye to the small screen? Would you realistically pay to see a 24 movie? 24: Casting Notice Says FOX Show’s Ending?